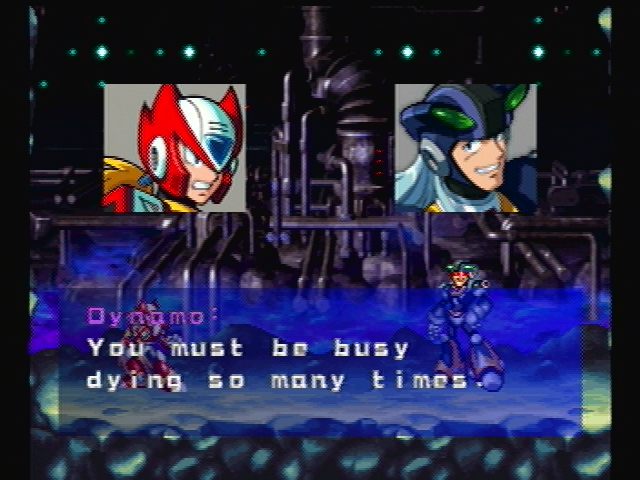 Using both the original Japanese and English localization as sources, DuoDynamo has been hard at work re-translating Mega Man X6. His work-in-progress script, which can be found in a publicly available Google Drive directory, hopes to provide fans with more lively and believable dialogue while still remaining faithful to the source material. The work completed so far has been dived up between "Events" (cutscenes) and "Stages" (Alia tips and boss dialogue). Isoc: To all Reploids remaining on Earth, a minute of your attention! As you all know, a bizarre event has been taking place all around the globe. It is a phenomenon we have decided to dub the “Nightmare”. It causes Reploids to see disturbing visions, akin to actual nightmares. These visions often cause Reploids to lose self control and act violently. There have even been accounts of fatalities due to these brutal behaviors. Ever since the Space Colony Eurasia incident, the population count for humans and Reploids has been at an all-time low. Therefore, we cannot afford any more losses! 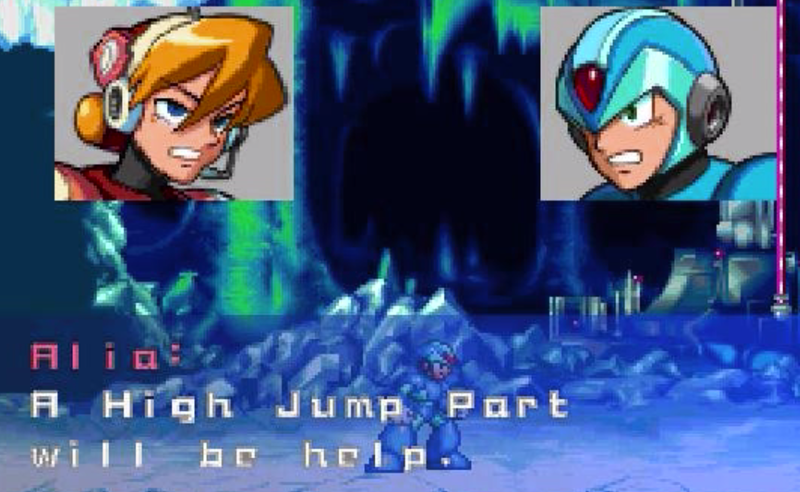 The lack of able bodied Reploids has put us on the brink of a global crisis! To prevent that, in order to assess the true nature of the Nightmare phenomenon,we have sent investigators to eight areas of interest around the globe. However, even now, we do have one major lead: the late Maverick Hunter Zero.We suspect that leftovers of his data are the source of this phenomenon…. like a ghost haunting the living. Ultimately, DuoDynamo intends for his script to be used for a patch. He admits he has no idea how to create a patch so help would very much be appreciated on that front. Drop him a comment below if you're interested. Best of luck to DuoDynamo! Please be sure to check out his progress every now and then! So bad that I don't know anything about this kind of rom modification, but it looks so promising, I hope someone with the proper knowledge can help, good luck, Duo. X7 is in dire need of a new translation, too. Tonion's still a goofball, but all of the rest of the dialogue is completely different if you listen to the Japanese dub. Sigma's "speech" to X at the end is only a couple of lines in English, but it's like 5 minutes long in Japanese. Cool. Is he going to make an effort to fix the gameplay too? If so, I might actually play it. One thing I'd like to do (though I have no idea if it's possible at all) is remove all Nightmare environmental effects altogether (as well as allowing X and Zero to break the wall at Blizzard Wolfang's stage to make up for it), since they're mostly useless in terms of level design and only exist to frustrate the player. That, and making it possible to traverse Gate's 1st stage without Zero or the Shadow Armor. Gameplay? Aside from overly difficult map design it seemed fine, I actually enjoyed the challenge after X5. Disabling nightmare effects should be doable with just a gameshark. Actually, it's possible to traverse Gate's 1st stage with Blade Armor too. The only problem by doing so is you have to equip the Part that extends the time you are invulnerable after being hit, and be hit by the wolves at each climbing haha. "You can to do it Zero!" Holy crap, I literally JUST went over this one and it totally passed me by. Man, this script never ceases to amaze me. Hey Man, I Am Interested in working together as i am Making an English Redub For Mega Man X6 and i would like translations too, we could work together if you want to. Awful game, good characters, so a pretty worthy cause. Glad you asked. It has been done, in fact. In fact, this script is what gave me the idea to retranslate X6 in the first place. Granted, I don't think there's a patched rom out there yet, but the script's there. It does make a lot more sense than the original too. First of all, thanks for taking on this task, any kind of improvement over these games is very appreciated by the fans. I wanted to suggest you to take your project to romhacking.net's message board. You may have luck finding a partner to insert your script into the game, or at least some guidence if you ever decide to try to do it yourself. Right now, there's a project going on to make improvements on Mega Man X5 by the user DarkSamus993. You should definitely try to contact him. Of the hackers currently active, he's probably the one with the most experience hacking the PS1 Mega Man X games. Wow....that's great! I'll have to replay the game when he finishes it! I believe this is something that was supposed to have been done in the X Collection, but as usual with Capcom development, time was short. I love the idea and I'd actually like to assist with the project. I think it'd be fun to perfect the script as much as possible to really let the story shine through. Alas, I don't have any idea on how to actually apply the patch. It might be easier with the PC version, or maybe patching a PS1 ISO with Lunar IPS or something. I thought this as well. If memory serves, it was because they didn't want to derail Irregular Hunter X on the PSP. Which didn't take off anyway. I even heard they had done all the new content, but chose NOT to include it due to IHX. I thought that holding off on new content for the X Collection was actually Inafune's idea? His reasoning was because he wanted to save the new content for Maverick Hunter X and its upcoming sequels. Well, all I know is that was a stupid idea holding off on the new content and releasing Maverick Hunter X on the PSP instead of the PS2 and Gamecube was an even stupider idea. In the end, the gamers lose out. Reminds me of Zoro and Zolo. I personally think Zolo sounds cooler and is more original, but everyone hates it. Zello sounds like a sick name too. Sounds like a god. Thanks for the information. Much appreciated! An accurate translation is better. I never understand why Capcom of USA might have a mess it up. The same is said for MegaMan and Bass GBA version. Sighing. Interesting.. A fan didn't include Japanese text script in his Google drive. Only English translation script. Why don't translator include Japanese text script ? Here's the japanese script I'm using. It's a little confusing to navigate, but it has absolutely everything. This is awesome! I'm reading the scripts right now! This makes me want to play the game from the beginning! I hope he gets the programmer that he needs to patch the game. Sadly tho it won't be me I program but don't know how to hack game text. Finally somebody is doing it! This is an important step for western fans, just like Boco the Chokobo Rockman X2 translation back in the day. I don't believe it... Someone still remembers the work we did back in the day? I'm glad to hear it! TDOMMX here, credited in Boco's scripts as the guy who "forced" her to translate Rockman X and Rockman X2 into English. I'm also the guy who hacked a modified version of her script into the Megaman X ROM, releasing it under the name "Megaman X Complete". You probably won't find our release if you Google it since we weren't satisfied with the finished product and decided to close up shop before it was mirrored on translation sites (we wanted hone our localization skills before even thinking of continuing onto X2). Now that I'm a professional localization specialist, I'd love to revisit the project that started me down this road. When my free time permits, of course (I moonlight as a localizer while I work a day job to keep the bills paid -- it's a rough workload, but totally worth it). I used to think that X6 was fine, but then when I played it recently (granted, on Hard mode), I find that it's actually pretty lousy. Not X7 bad, but definitely not good. That so-called translation for X6 was insufferably embarrassing to sit through. It's like Capcom USA thought people must be too stupid to care or read text in a Mega Man X game, so they just ran the whole thing through Babelfish. I was hoping it would all be coherent for the X Collection, but that didn't happen. It almost was along with retranslating, redubbing, and adding new features for x4-6 but capcom of Japan didn't want it interfering with maverick hunter x and made capcom USA take everything out at the last minute. And we know how mhx went. I know, which is why I said, "I was hoping it would all be coherent for the X Collection, but that didn't happen." Cursed Capcom, always taking the fun out of Mega Man at every turn. Wow, that new translation actually makes sense. Glad to see this is happening. DuoDynamo should fix Megaman X5 and take out those stupid Guns N' Roses-themed names. X5 is in dire need of a rewrite and recode. Getting rid of Alia with her incessant prompts would be sweet, too. She contributes nothing and shouldn't really have been introduced so late into the series, despite X6. Also that intro stage theme for X sucked, and so did his armor system. I did consider that, but no promises so far. To be fair, the Japanese names for the Maverick bosses throughout the entire X series are equally stupid-sounding. If they're going to stick to consistency, they need to make it follow the localization for the SNES games, such as calling him Tidal Whale, for example (certainly not Tidal Makoeen, as that just sounds absurd). Awesome! I honestly love how hard X6 is. The only thing that bothered me was Zero's kamikaze attack which will get you killed very easily which is a shame because it's a really powerful attack. A bit off-topic, but the people at Irregular Hunter Productions need editors and someone that can check the translation for Beast+. I think it is hard tho, what you call cheap level design I call hard. What you probably call great level design(? don't know the opposite of cheap in this context) I would probably call easy. Like people complain about MMZ being hard, I have to literally handicap myself just for those games to give me a challenge (and I usually don't like playing like that, since I like to 100% games and use the tools in game that come from that), anything less than MMZ difficulty and I might as well play Kirby. lol, I'm obviously referring to Zero's Sentsuizan(holding up in the air + square). I hope this project goes as far as correcting the references in its naming scheme. "Isoc" is supposed to be "Isaac", as in Isaac Asimov (the author of the Rules of Robotics cited in Dr. Light's warning in the original Megaman X), and "High Max" should be "Himax" (Himax Technologies is a semiconductor manufacturer founded a few months before X6's release that Capcom appears to have been doing business with at the time). As a localization specialist, it's a bit disheartening to see deliberate references lost in translation. See: "Curly" in Castlevania: Aria of Sorrow instead of "Kali", "Miss Joan" in Megaman Zero instead of "Miss Jaune" (every Resistance member has a French name, so how did they miss the parallel between her and Miss Rouge, also named after a French color? 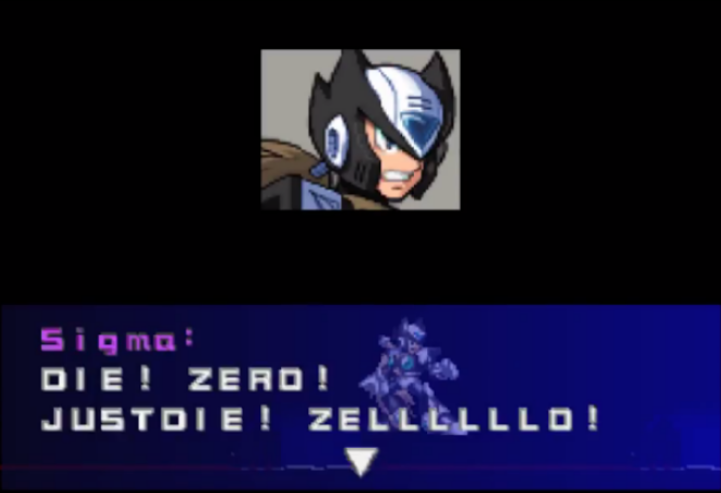 ), "Serges" in Megaman X2 instead of "Sagesse" (the X-Hunters are all named after French words for one of Zero's noteworthy characteristics: "Violent" (violent/fierce, pronounced "VEE-oh-LAHN" in French), "Sagesse" (wise, "sah-JESS"), and "Agile" (agile/quick, "ah-JEEL"). Sorry if it seems like I'm splitting hairs, but noticing this stuff is my literal job. Plus, I've been bilingual in English and French since I was 5, so missed French references and typos really stick out to me. Isoc was meant to be Isaac? Do you have any sources for that? Not that I doubt you, but his japanese name is read as 'Aizokku', instead of Newton's 'Aizakku'. It might be a deliberate change, even if the reference is still there. That aside, I did change High Max to Hi-Max. I also considered changing 'Zero Nightmare' to 'Nightmare Zero', seeing as it is a single entity as opposed to a widespread phenomenon like the rest of the Nightmare, but I'm still not sure about this change. Isoc and High Max are cooler names, at least is not that different to their Japanese translations. Hi, DuoDynaMO (is the name right? rs). I'm working on insert your re-translation in the game (or what is possible at least, cause most of the text is bigger than the space the game offers to it), but it's not possible (for now) doing it as it is due to limited space for the characters, so I had to do some little changes but I'm trying to approach what you did. As long as I finish, I'll send to you some result. Call me at romhacking.net: phmt6. I would love to help you with these translations! In fact, I started a petition at one point to get Capcom to rerelease X6 on American PSN. To think, Capcom went and redid X5's translation (including replacing the Guns 'N Roses Maverick names with properly-translated versions of their Japan names), but X6 is still its same badly-translated self.